Kiesel Guitars has been around for 70 years in one form or another, but the instruments they now produce are far from retro, and the Californian firm has forged a speedy niche for themselves in the world of headless and 7-string models. 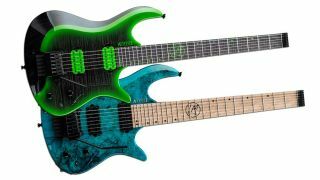 Now, it's teamed up with metalcore band Born of Osiris's guitarist Lee McKinney to produce two new models, the imaginatively-monikered Lee McKinney LM6X & LM7X headless guitars. Keisel says, "These guitars combine the aesthetic of the single-cutaway Zeus Series and the double-cutaway Osiris Series in one complete instrument, ideally suited for any genre of playing, and spec'd out just the way Lee likes them." The LM6X and LM7X are available with some Custom Shop options, but the standard features include a chambered swamp ash body with maple neck, 4A flamed maple top, stainless steel jumbo frets and Kiesel-designed Hipshot tremolo. All entries in the LM headless series come equipped with the new Lee McKinney Illusionist bridge pickup, Kiesel Lithium neck pickup, and acoustic bridge saddles. Electronics consist of a volume control for the humbuckers, volume control for the acoustic saddles, with a mini-toggle switch for selecting humbuckers, acoustic or both, and a 5-way blade selector for selecting different humbucker coils. Head over to KieselGuitars.com for more details.